Some Method users may have their email set up through Microsoft Exchange Online. Depending on your email server setup, their setup instructions may not initially work with Method’s default email server setup. Please refer to the solution below! These instructions may vary depending on your setup. They are provided as a means to help troubleshoot. If these steps do not work for you, please contact our Support Team. 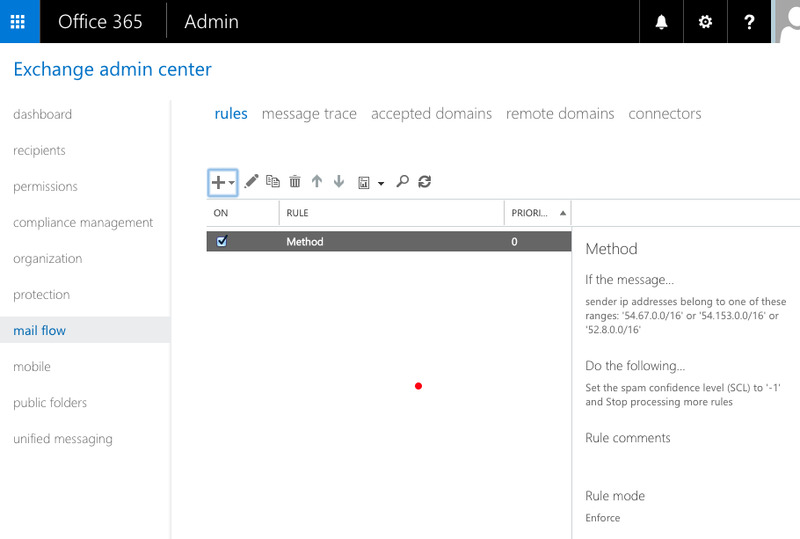 In Office 365, select the Exchange Admin Center. Once there, select Mail flow > Rules. If you do not see the Rules section, contact Microsoft to upgrade your account. Select Create a new rule. Give your rule a name, then click More options. Under Apply this rule if, select The sender, then choose IP address is in any of these ranges or exactly matches. Under Do the following, set the action by choosing Modify the message properties. Under Set the spam confidence level (SCL), select Bypass spam filtering, then click OK.
Click Save to save the rule. It will now appear in your list of rules. After you create and enforce the rule, spam filtering is bypassed for the IP address range you specified. When you have completed these steps, you can then set your default email preferences in Method using the information for Microsoft Exchange Online.